“Compassion”, “Dialogue”, and “Tolerance” seem to be the latest buzzwords used to talk about solutions to divides. His Holiness the Dalai Lama has been saying these terms for over fifty years. To Him, they are not just words: they are a set of ideals, a way of living, a way of being. A longtime advocate for the Tibetan people and the Central Tibetan Administration in exile, His Holiness the Dalai Lama is a powerful orator with a powerful following, inspiring wherever he goes. It is time his views and beliefs are captured within an equally powerful medium: film. Entropy Productions led by Peter Bisanz – a longtime advocate and friend of the Tibetan people – will document the interfaith journey of His Holiness the Dalai Lama over the next two years. 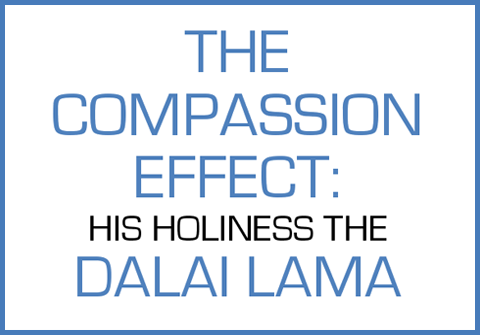 The Compassion Effect is a historically reflective and emotionally intense documentary about the life and work of His Holiness the Dalai Lama. The film will recount the life achievements and speak to the vision of a spiritual leader who sleeps but a few hours a day so that millions of people around the world have the means and motivation to improve their quality of life and state of mind. On a primary level this is a biography with a strong observational component as the film follows His Holiness the Dalai Lama’s interfaith journey, visiting interfaith services at religious sites in Jerusalem, India, the Middle East, the Far East, and the US, and meeting world and spiritual leaders including the Pope, Muslim leaders, and heads of state. But on secondary and tertiary levels, this is about how peoples of all faiths can co-exist in peace and how underappreciated inner peace and the power of compassion is in resolving differences. His Holiness has also laid an incredible with world renown scientists on studying the psychological and physiological effects of compassion, kindness and meditation on the human body. Sharing these secular values, taken from the Buddhist tradition, is of great interest to His Holiness. This documentary will serve as a platform for honest discourse on the wider themes and it aspires to use the power of film to make a positive impact in our world.